When talks between the City of West Linn and the Clackamas County Tourism & Cultural Affairs (CCTCA) group regarding future occupancy of the old city hall building broke down last January, representatives from other local organizations weren't shy in expressing their disappointment. The Willamette Falls Heritage Area Coalition (WFHAC) was one of those groups, but its leaders weren't ready to move on just yet. Instead, they spent much of 2018 working on a proposal to take CCTCA's place as the primary occupant of what would be called a "cultural center" at the old waterfront building. Optimism built as the City and WFHAC coalition negotiated this fall, but nothing could be certain until the two sides agreed on a letter of intent for use of the city-owned property. When the City Council voted unanimously to approve that letter Dec. 10, the level of commitment was even better than WFHAC members had hoped for. "The City Council exceeded our expectations with their unanimous support," WFHAC President Jon Gustafson said in a press release. "They are able to visualize the value of this project as we move forward in developing an arts, heritage and tourism cultural center. The location is pivotal as the gateway to West Linn, the State Heritage Area and the pending National Heritage Area (at Willamette Falls). Our timing could not be better." Perhaps more important than the unanimous vote was the dollar figure attached to it. In an initial proposal, WFHAC estimated that the City would have to put up about $300,000 for renovations at the building, which would supplement $150,000 from WFHAC and a $100,000 grant from CCTCA. The letter of intent went beyond WFHAC's expectations, as the City agreed to reserve $400,000 in general obligation (GO) bond funds for the project. The letter does not require the City to spend that exact amount, but insures that it will at least be available once exact costs for the project have been determined. 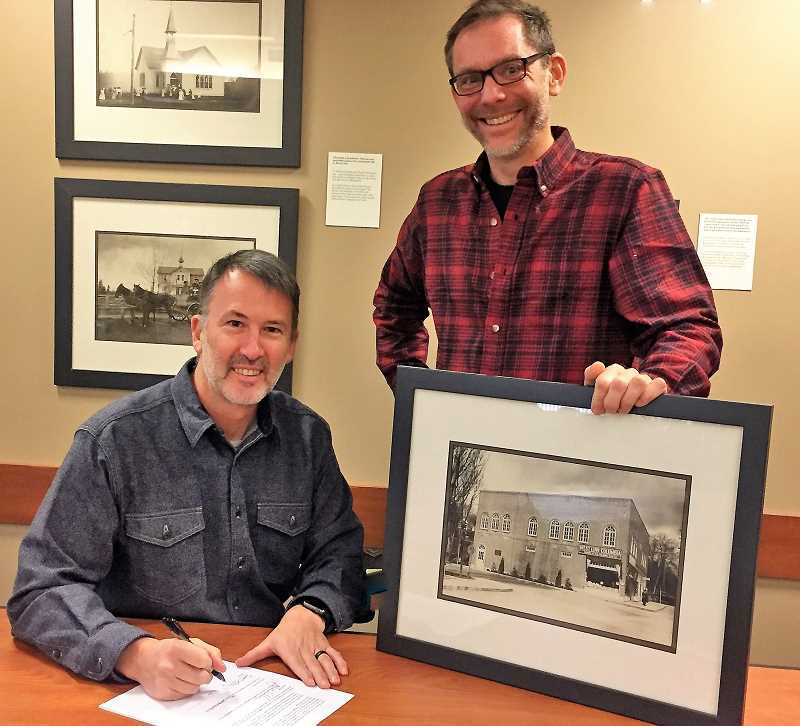 WFHAC — which has spent years working to create a National Heritage Area around the Willamette Falls — will serve as the leader of a collection of nonprofit organizations that will work in and help manage the building as a new cultural center in partnership with the City. Specifically, WFHAC envisions a first floor cultural center with exhibits and interpretive installations that could tell visitors about the riverfront area. The second floor would be used for office space and community meetings, in partnership with other nonprofits like the Willamette Falls Heritage Area Foundation, Rediscover the Falls and the Clackamas County Arts Alliance. The letter of intent lays out a process that's split into two phases. First, the City and WFHAC will work together in a "due diligence" process that will determine exactly what's needed for the building — which was last used as a police station in 2014 — to be reopened. Renovations at the building will be done in phase two. "The (first) task is really understanding what the building requires and how much that work will cost, and identifying funding sources that can pay for it," West Linn Community Development Director John Williams said. "We'll be bringing experts through the building — architects, mechanical systems people — and identifying what has to be done to make it habitable for the use we have in mind. ... With a public occupancy, you really have to make sure the building is safe, and that will take a little work to figure out." The due diligence phase is estimated to last about six months, and Williams said the two parties planned to meet this week to discuss the next steps. The City will likely utilize information from prior evaluations of the building as a starting place, according to Williams. Beyond addressing the conditions of the building, the two groups must also discuss how the operation of the facility will be financed. "Another huge part is, what is the financing plan for operating and maintaining the building?" Williams said. "Where do operating funds come from? What is the financial agreement between the City and coalition ... everything from who pays for utilities to who pays for major capital projects? "Sometimes that stuff is as difficult, or more difficult, than the engineering and architecture elements."